Ceramic apple sculpture by Hans Hedberg, 1994, resting poolside at La Colombe d’Or. Sculptor and ceramicist Hans Hedberg was born in Sweden but resided in the south of France in his forties, in 1949, and quickly became one of the best-known artists on the area. Picasso and Léger visited his studio, and Chagall even stayed as his a student for three months. Hedberg is most famous for his late work: sculptures of intensely colored fruit such as pumpkins, plums, apples, pears and lemons. 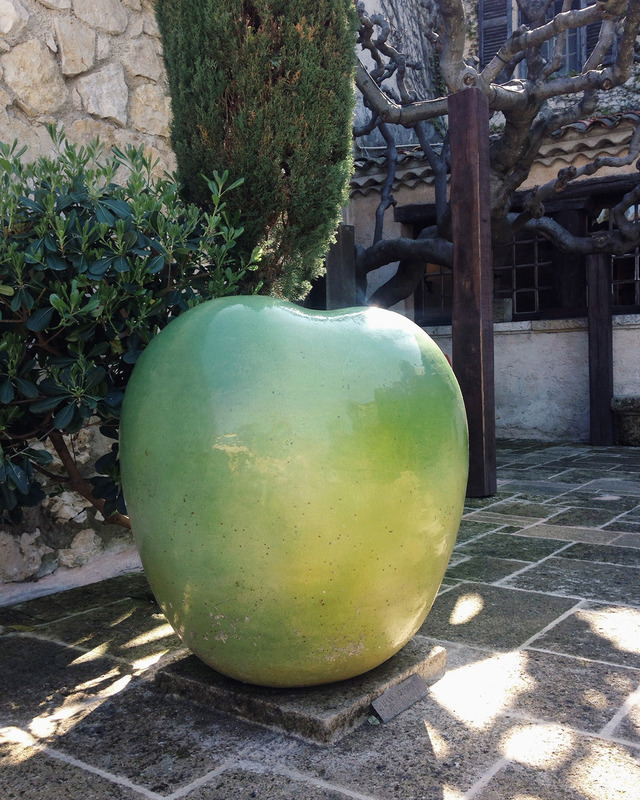 This bright green ceramic apple sculpture is part of the private collection of La Colombe d’Or hotel in Saint-Paul de Vence, Provence, France.